Carrying the prestigious title of ‘largest cat in the Americas’, Jaguars are arguably the top prize of a South American safari, and the stunning setting of the Pantanal in Brazil, which plays host to the Jaguar Safari, is the best destination for viewing and photographing them in their natural habitat. Exploring the many waterways in open-air boats designed to get you close to the action, you will search the riverbanks for a look at these elusive cats. 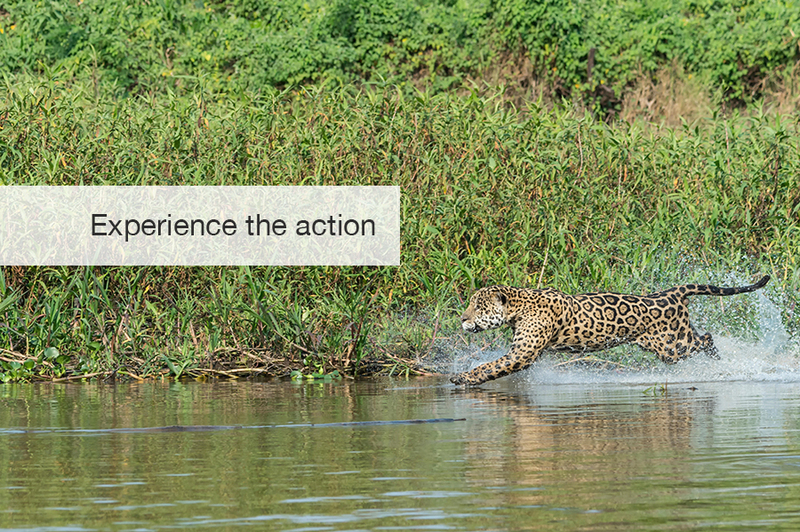 Jaguars can be observed relaxing on the river banks or with a bit of luck catching caiman crocodiles in the water – a sure highlight on any Jaguar safari! 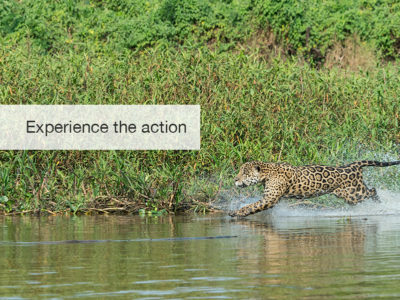 Being a water-based safari, the best way to experience the wonders of the Pantanal is from the comfort of an intimate Flotel situated on the banks of the same rivers where you search for Jaguars. 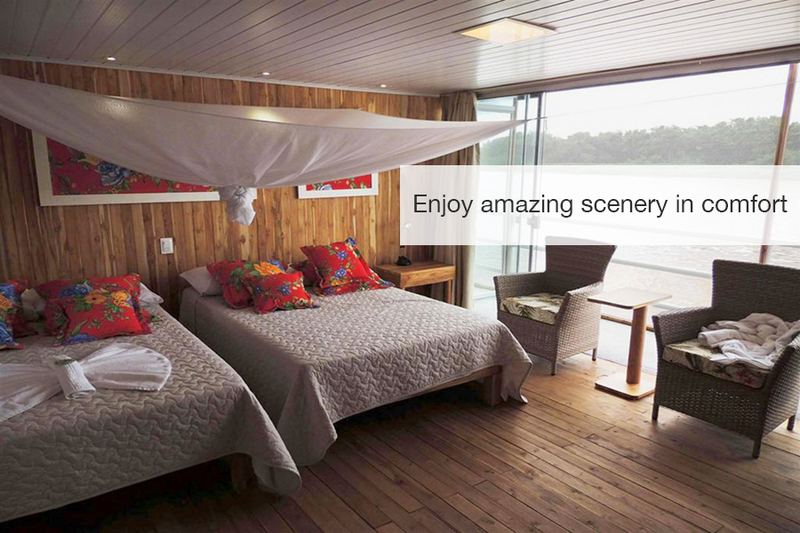 Cabins are air conditioned and have all the necessary comforts and amenities. 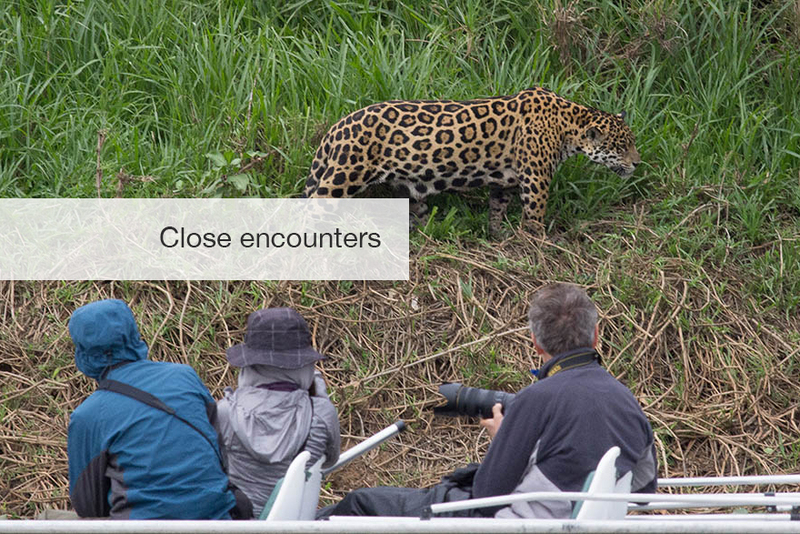 With Jaguars often spotted from the rooms be sure to keep an eye on the banks even when you are relaxing. Cruising along the channels of this extensive freshwater wetland, Jaguars are not the only animals you can expect to see however; there are good numbers of the endlessly entertaining Giant River Otters, Lowland Tapirs, Giant Anteaters, Capybaras, Marsh Deer, Black Howler Monkeys and just over 550 different species of birds! Brazil has so many incredible things to see and do, and with the Amazon just a short plane ride away, you can easily extend this safari. 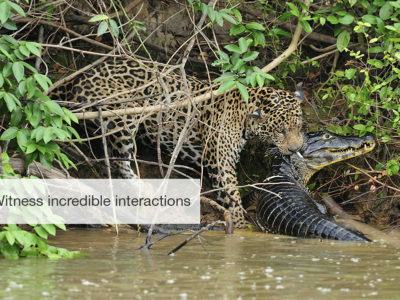 Wild jaguars, exotic wildlife and the lush wetland scenery on this safari will leave you in awe. Contact our safari specialists to help you plan your dream safari! 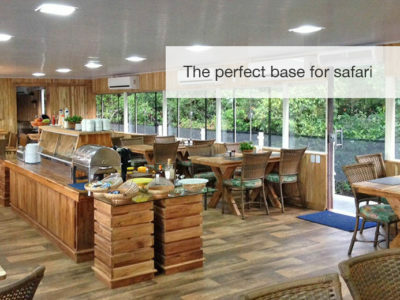 Upon your arrival at Cuiaba Airport you will be met by a local guide and transferred to the lodge along the Transpantaneira Road, where you may have your first wildlife encounters. A simple lodge with friendly service set on the banks of Rio Pixaim, this is an area abundant with wildlife including Tapirs, Giant River Otters, and the striking Hyacinth Macaws. 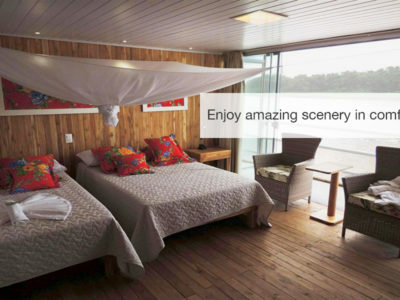 Get an early start and make your way to the waterways of the Pantanal, where you take a boat transfer to the Jaguar Research Centre for lunch before arriving at a cosy and intimate Flotel, with air-conditioned cabins that have all the necessary comforts and amenities. 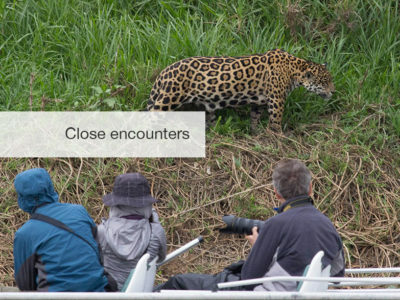 With Jaguars often spotted from the rooms of the Flotel now your search for the Jaguar really begins! 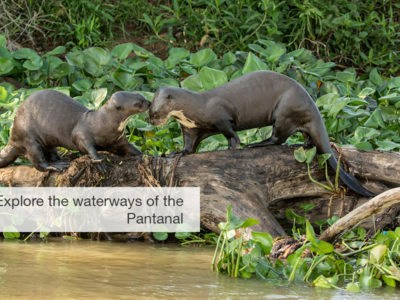 Two safaris per day in open-air boats designed to get you close to the riverbanks, take you into the heart of the Pantanal where Jaguars and Giant River Otters thrive. 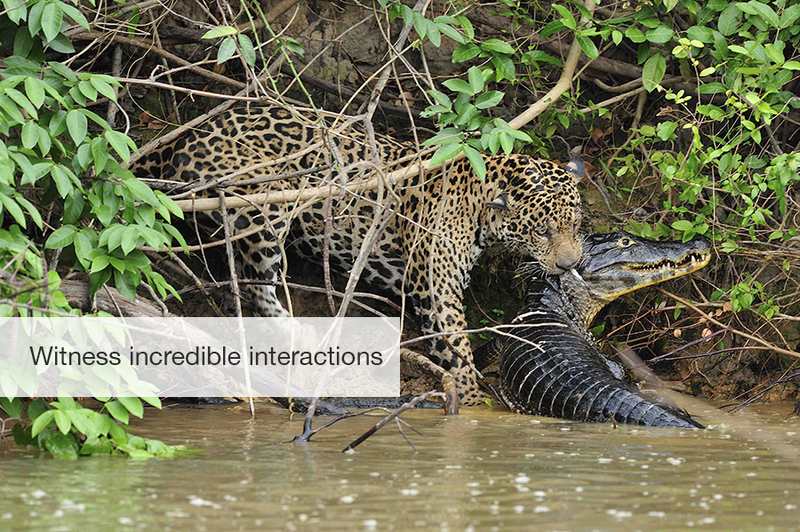 Each safari is about 4 hours long, giving you ample time with the biggest cat in the Americas and the playful Otters. 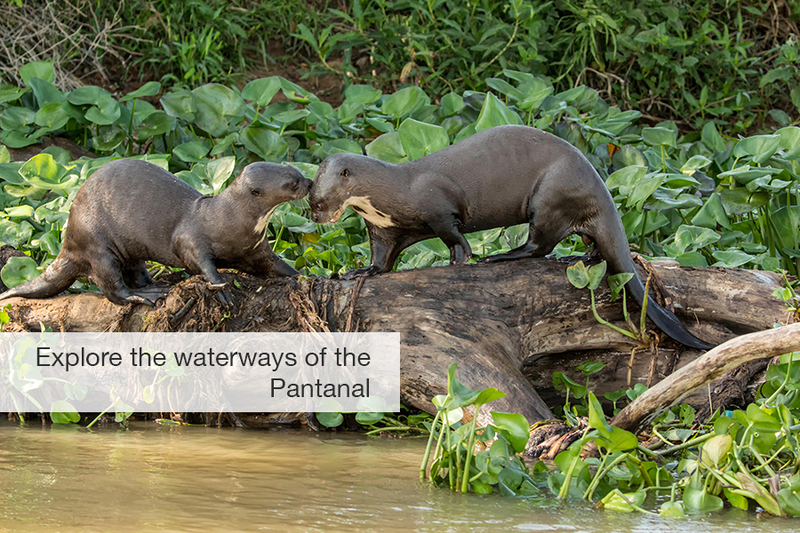 In the evenings lectures are offered in the dining hall, explaining some of the more intricate details of the Pantanal. Following a hearty breakfast, you will have a final safari before heading back to dry land and returning to the lodge on the banks of the Rio Pixaim where you spent your first night. After dinner you will get the chance to head out in the night using a spotlight to try to find some of the more elusive nocturnal animals hiding in the dark. 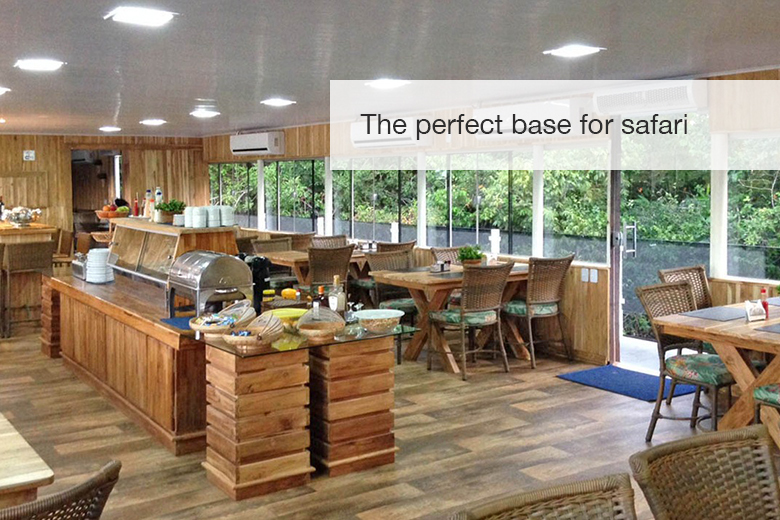 Enjoy another good breakfast amidst exotic plants, birds and other wildlife found around the lodge, before your drive back to Cuiaba Airport. You will reach the airport around noon, from were you continue with your onwards travels.